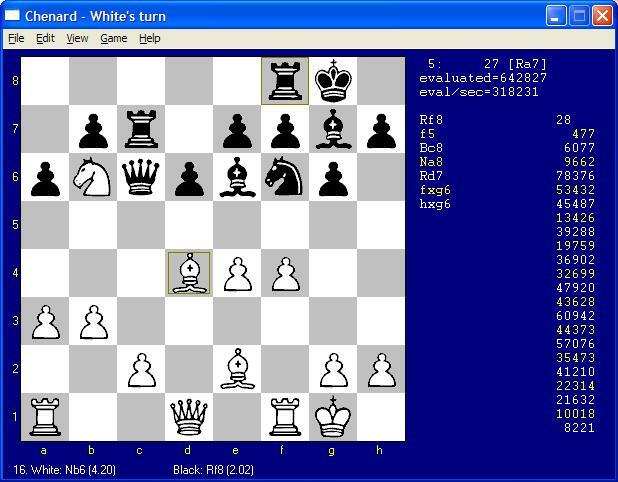 a freeware chess program by Don Cross. - Added "Blunder Alert" feature. (Thanks to Tim Tennyson for the idea.) When defining players at the beginning of a game, there is a new check box for each player. If Human is selected for a side, the check box enables a warning if the player makes a blunder. The warning prevents the move from taking effect and shows analysis of what is wrong with the move at the bottom of the window, along with a better continuation. Once warned for a given position, the player can make any move without being warned again, including the original move (in case the player disagrees with the warning). - Fixed a problem that prevented loading PGN files generated by other programs that contained annotations of alternative moves in parentheses. Before this fix, Chenard would display an error message that said "Problem loading pgn file: unknown state". This bug exists only in the previous version (2013.01.06). When the bug happened, you would see a dialog box pop up that said "Chenard fatal error" immediately after you made a move, and the program would close. Blunder alert sometimes missed detecting a player's blunder if the player's opponent had only one legal move. This has been fixed. - In Game / Suggest Move command, added a checkbox to enable/disable making an attention sound after analysis is complete. - Added a Game / Suggest Move Again command, which is the same as Suggest Move, only it repeats the think time and attention sound options used for the previous move suggestion without first displaying a dialog box to edit them. Fixes for problems that had crept into the Linux versions of Chenard. - Fixed C++ compiler errors in the source file lichess.cpp. - Fixed segmentation fault crash in Linux version of xchenard caused by incorrect initialization order of global C++ objects.